Here we are in 2018… and the rumors of the death of film have been greatly exaggerated. In fact, I doubt they are taken seriously anymore. I’ll admit, things did get quite bleak between 2009 – 2014. But we still have one manufacturer of negative film (Kodak) and a few film labs still going strong. Two of the five AMPAS best cinematography nominees were shot on film – that’s 40%. And the film formats used: Super 16mm for Carol and 65mm Anamorphic (Ultra Panavision) for The Hateful Eight. So it’s really only 35mm film that’s missing out! The biggest obstacle to Super 16 conversion today is that the cost of 16mm cameras is so low, yet it doesn’t get any cheaper to do the conversion. So you can end up in a situation where the conversion exceeds the cost of the camera. This makes buying an already converted camera, or a factory Super 16 camera a more attractive choice. For this reason, Super 16 conversion of 16SR cameras is generally unavailable today. But I think there is a need for information about proper Super 16 conversion, so I am maintaining this page. This article was originally written in 2001 and has had some updates since then, including some minor updates in January and December 2016. The text contains some outdated references to the situation 10 years ago, especially with regard to prices for the conversion. Today, a majority of ARRI 16SR owners are converting their cameras to Super-16. In the recent past, this was considered a wise investment in the future. Today, most owner-operators realize that Super 16 conversion is mandatory in order to remain competitive in the market. Simply put, for all practical purposes, if your camera is not S16 capable, it will not earn you any money. Regular-16mm is now known as an old-fashioned, nearly obsolete format that is mostly used by film students. Along with the new aspect ratio, which is better suited to advanced television (ATSC) display, the increased resolution of Super-16 over Regular-16 is mandatory for any programming that seeks to be viable in the age of digital television. This increase in resolution is quite easily perceptible on an analog standard-definition TV monitor. When 35mm cannot be used, Super-16 provides the closest approximation in quality to 35mm for essentially the same cost as Regular 16mm. A properly executed Super-16 conversion also adds substantial resale value to your 16SR, preserving the value of your investment. The new technology of Digital Intermediates has created renewed interest in the Super-16 format for feature film production. Originally used for special effects sequences only, Digital Intermediate technology was first used for an entire film on “Pleasantville”. It was used on Victor Nuñez’s Super-16 feature “Coastlines”. The process involves scanning the original camera negative on a digital film scanner (not a standard telecine), at 2K resolution (2048 horizontal pixels) making color corrections and other changes in the digital realm, and outputting directly to 35mm release print stock on a film scanner such as the ARRI Laser. This avoids going through the Interpositive and Internegative steps that increase cost and reduce the resolution of the final print. The final result looks like a print struck directly from the original negative. The introduction of two new Vision 2 filmstocks by Kodak further expands the possibilies of Super 16. It is now posible with the Vision 2 100T 7212 filmstock to EXCEED the resolution of uncompressed 1080p HD D-5 video video with Super 16. Since 2000, CinemaTechnic has teamed up with P+S Technik of Germany to offer the finest Super-16 conversions and Evolution upgrades on the market for the ARRI 16SR. CinemaTechnic also offers a low-cost S16 conversion for those who do not need all the features of the P+S SR Evolution conversion. On the body, the gate must be changed to Super 16. This is optimally done by replacing the entire gate. Both CinemaTechnic and P+S Technik can install a new SR-3 gate, which includes the new side rails. It is not available without the rails. These gate rails spend their entire lives with a sharp edge of film rubbing against them. Even though they are made of hardened stainless steel, thousands of feet of film will wear grooves in these rails over the course of years of use. If you have never changed your rails, it is a good idea to do so, because they wear out, and this will cause side-to-side image unsteadiness. There are two types of gates available. There a few different Super 16 gates available. The earliest is the SRII Super 16 gate which is essentially the same as the SR2 gate, but with the proper Super-16 aperture size. The bearing surface on the left (Super-16) side is much thinner so as to not contact the film in the image area. The SRII S16 gate is similar to the SR3 Mk.I S16 gate but has a small space for a timecode head and does not have the space for the blocking plate to convert the gate back to standard 16. The SR3 Advanced gate is a new design that uses hard chrome plating instead of nickel, and gate rails that make contact along their entire length, instead of just at the top and bottom. Lateral film steadiness is maintained by sapphire rollers. The advantage of this gate is that the sapphire rollers will never wear out. It is also possible to modify the SRI or SRII N16 gate to Super-16 format. If done properly, the results can be entirely satisfactory. At CinemaTechnic, we have developed a process using high precision EDM machining to convert the original gates to S16. The gates are subsequently micro-lapped for an improved smooth finish to the nickel plating. Our clients have shot over 50,000 feet of film through a modified SRII gate on our camera with no problems. The modifed gate is the lowest cost option, and is the standard item offered with our low cost Super 16 conversion. The lens mount must be re-aligned with the center of the larger gate. The most common, and still the best method for doing this is to remove the Bayonet mount and replace it with a new PL mount. In response to requests from our clients, we have developed a method for re-aligning the original Bayonet mount. Bayonet Super 16 upgrade is not switchable, but permanently set to Super 16 centering. The advantage of the Bayonet upgrade is a cost that is less than the cost of the PL mount upgrade, and does not require the use of a Bayonet to PL adapter. The P+S PL mount upgrade is eccentric which allows the centering to be easily switched between standard and Super-16. In order to swich formats, you must also have one 16SR Fiberscreen (ground glass) for the standard 16 format, and one for the Super 16 format. This is the same method used on the SR3 and most 35mm cameras to switch between regular and Super formats. I also believe the PL mount is superior to bayonet. You can still use Bayonet or ARRI Standard lenses with the appropriate adapters, and now lenses mount straight in, rather than rotating, which makes lens changes easier when using primes with a Matte Box and Follow Focus. The P+S Technik conversion also includes a button that allows you to mount Bayonet mount lenses without removing the Bayonet to PL adapter. This requires the use of the ARRI Universal Bayonet to PL adapter. Compare the P+S Technik PL mount conversion, in the photo at left, with an original ARRI SR3 PL mount. Note that they both use 6 screws. This allows the use of standard ARRI shims behind the mount, which makes calibration much easier. The only difference is that P+S has shifted the pattern slightly to better fit the SR 1 and 2. Some other conversions use the original SR mounting holes to save precision machining costs in preparing the front castings. Because of this they must use a PL mount with 8 screws, which requires custom shims. CinemaTechnic is now offering a PL mount option for our low cost Super 16 conversion. Our PL mount is not eccentric, and is permanently set to Super 16 centering by the centering ring that is mounted behind the PL mount (inside the camera). Our PL mount is designed so that it can be installed on a camera that has already had our bayonet mount Super 16 conversion, and it takes advantage of the modifications already performed on the front casting to shift the centering of the bayonet mount. Our PL mount uses six mounting screws and is compatible with ARRI shims. 16SR II with P+S Technik PL mount and Jurgen’s video assist tap. 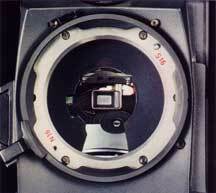 The optical center of the viewfinder port must be re-aligned for Super-16. This is done by very accurately machining the mounting points slightly to the right. The photo at left shows the SR3’s eccentric viewfinder mount. In the SR3 it is possible to remove this mount and rotate it 180º; to switch from normal to Super-16. In practice, very few SR3 owners ever shift this part. Instead it is left in the Super-16 position where it also covers normal 16, although the image is shifted slightly to the left. The P+S conversion looks similar to this. The only difference is that P+S leaves the mount set in the Super-16 position. The CinemaTechnic low cost conversion is essentially identical to the P+S conversion in this regard. There is also a mirror mounted just inside the camera, behind the viewfinder mount. Early mirrors had only one adjustment screw (for top-bottom image adjustment). The newer mirrors have three screws, allowing side to side adjustment, which is very desirable since it allows for the best placement of the larger Super 16 ground glass image within the SR I/II viewfinder. The standard ARRI eyepiece supplied with the 16SR is not well suited for Super 16 use. With the standard eyecup, and especially if used with an eyepiece chamois, it is not possible to see the entire Super 16 image, without moving your eye. We recommend upgrading to either the P+S Technik Super Wide Angle Eyepiece, the Kish Optics Kish Eye eyepiece or the ARRI 40mm eye pice (used on the 35BL4). P+S modifies the SR I-II viewfinder in a similar way, although on converted cameras it remains set for Super-16. 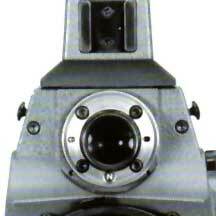 Very few SR-3 owners ever switch the viewfider centering, opting instead to leave it centered for Super-16. The 180º mirror shutter as it is set up from the factory in the original timing does not cover Super-16. If you look at your camera and advance the shutter (looking from the lens port) until it lines up with the edge of the frameline on the standard 16 Fiberscreen, then look at the gate, you will see that the registration pin has withdrawn and the transport claw is just beginning the stroke. This means that the film will be moving before the shutter reaches the edge of the new wider gate. This will result in blurred images at the edge of frame. In the past the solution for this was to install an new 172.8º glass mirror shutter. Not only was the new shutter expensive, approximately $2500, but you are wasting a perfectly good 180º mirror. Also, because the silver part of the mirror (on the 172.8º) is greater than 180º, you cannot see the scan line when you shoot monitors. A film/video synchronizing accessory (such as the one sold by Cinematography Electronics). Another solution that was tried by a number of vendors is to glue a 7.2º “wedge” of aluminum to one edge of the mirror shutter to change the shutter angle to 172.8º. This has the disadvantage of upsetting the very precise balance of the mirror shutter (ARRI dynamically balances them at the factory). 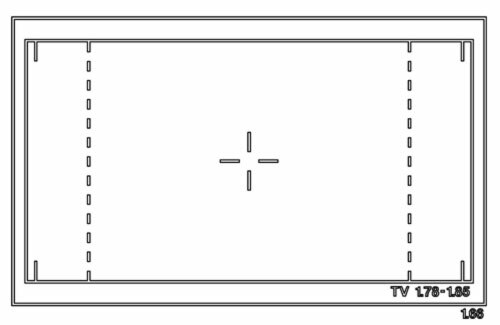 Since there only 180º of mirror surface, it is still possible to see the scan line in shoting monitors However, since the open side of the shutter was not centered with respect to the mirrored side (because the wedge is added to only one side of the shutter), it is still requires a sync accessory as mentioned above. P+S Technik’s solution is to modify the camera’s movement by upgrading it to the SR3 timing. This delays the start of the pull-down stroke, and advances the pull down speed. In this way the original 180º shutter is used. There is no compromise to the operation and reliability of the camera, as with other methods that involve modifing the shutter. This is essentially the same method that ARRI used on the SR-3 movement. Another plus with the P+S Technik conversion is that they perform a general overhaul of the movement in the process of the conversion. You have the benefit of ARRI factory-trained technicians servicing your camera, with all the latest tools available to them. The P+S Technik movement upgrade is only compatible with 16SR with serial numbers 60220 and above. For the CinemaTechnic low cost S16 conversion, we have developed both a balanced shutter angle conversion, which adds two very small pieces (3.6º each) of composite material to the leading and trailing edges of the shutter, and a modification for the movement. The shutter angle conversion has few practical drawbacks. The balance of the shutter is not affected and the silvered part is still 180º so there are no problems shooting monitors. A CinemaTechnic modified shutter looks like a stock shutter but with a thicker black stripe at runninng across the leading and trailing egdes. Because of the type of labor intensive precision work required to change the shutter angle, it adds significant cost to the conversion. Fortunately, most newer, or older 16SR’s that have been upgraded with the ARRI factory reccomended updates can retain the 180º shutter angle. Other older cameras with the smaller registration pin (sized less than 1.25 mm), that were never upgraded, will require the 172.8º shutter modification. Our movement modification includes a general overhaul of the camera’s film transport (movement). There are some parts that we reccomend replacing since the labor to dissasemble and assemble the transport is included. Commonly, the shutter gear needs upgrading to the new style, and most owners take advantage of the opportunity to replace the bearings in the transport. We encourage you to contact us via e-mail to discuss this. Due to the high cost of experienced technician labor and the low cost of used 16SR cameras, the movement upgrade is no longer viable since it requires a full overhaul (8-10 hours of labor at $150.- per hour). Fortunately we kept those special shutter wedges and still have a very small quantity available. We are making these wedges available with the Super 16 conversion kit mentioned above. NO MORE PARTS WILL BE MADE so if you want to do an S16 conversion grab it now! The standard 16mm format Fiber Optic Screen (let’s call it a Fiberscreen like ARRI does), needs to be switched with a Super-16 Fiberscreen. This is easiest part of the conversion, as it can be done by an experienced user with an relatively inexpensive tool. You can switch between regular and Super-16 Fiberscreens in the field. CinemaTechnic can convert your original standard-16mm Fiberscreen to Super-16. This service is very desirable since it will save you more than half of the $1,500.00 cost (USA price) of a new Fiberscreen. Since regular 16mm is rapidly becoming an obsolete format, most 16SR owners will never switch their cameras back to regular 16mm mode. It’s much easier to leave the camera set to Super-16, and simply use the 1.33:1 framing guides on the Fiberscreen if 1.33 framing is desired. A variety of format markings are available. 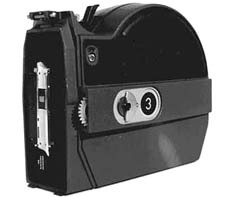 After conversion, your Fiberscreen will resemble an ARRI SR-3 Advanced Fiberscreen and will not have markings for the light meter needle. The conversion takes approximatley the same amount of time as the conversion of your camera (four weeks), and it is done in the U.S.
You can also purchase a new ARRI SR3 Super-16 Fiberscreen if you want to keep your old standard 16mm Fiberscreen. If purchased with a Super 16 conversion. Choose this option if the ability to switch back to Regular-16 format is desired. by re-installing the original Fiberscreen. We have a few SR3 fiberscreens and converted SR2 fiberscreens in stock. Click Here to see the available formats in original ARRI 16SR3 Fibersceens, and CinemaTechnic 16SR Fiberscreen Conversions. The SR mags need a few changes to ensure that film is not scratched in the Super-16 area (this is the area between the edge of the standard 16 frame and the Super-16 frame. The the main sprocketed film rollers, as well as the secondary rollers and the footage counter rollers must be machined. The ramps that feed the film into the upper and lower loops must also be machined. There are some that claim that the mags don’t need to be converted. This is simply not true. They say these things because the don’t shoot with these cameras, they only sell them, and they haven’t had the pleasure to sit in a $600/hr telecine suite and see their scratched film on the monitor while the colorist assures them that its “Not that bad”. Other people claim that the sprocket rollers do not need to be machined because the film is travelling at the same speed as the sprocket roller and cannot “slip” causing scratching, or that the inside throat or film “rapms” do not need to be modified. We have found that the new T-grain filmstocks are sensitive to the pressure this puts on the emulsion and it still causes visible problems. CinemaTechnic’s position is that any surface that contacts the part of the film that is in the image area needs to be fully relieved so that not contact takes place. We recommend the P+S Technik magazine conversion as it is completely contact-free. We are now also offering the Super 16 magazine upgrades here at CinemaTechnic. We can also “finish the job” if you have an improperly or incompletely converted magazine. PRICES ARE PROVIDED AS A REFERENCE ONLY. These services are no longer available. NOTE: All cameras for P+S conversion, to be handled by CinemaTechnic, must be shipped to us in Miami for evaluation, and will be return shipped by P+S to our location. Shipping between CinemaTechnic Miami and P+S Munich is billed to the customer at cost. In response to the repeated requests of our clients, we have developed new, less expensive options for Super 16 conversion of your Arriflex 16SR. Our low-cost Super 16 conversion is now available. The first twelve cameras with the low cost conversion (nine with our PL mount upgrade) have been delivered and are giving excellent results. Please contact us via e-mail for the latest information. This Page (cinematechnic.com/services/super-16_conversion.html) Text ©2001-2018 Jorge Diaz-Amador, All Rights Reserved.